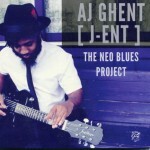 Florida-bred guitarist/vocalist AJ Ghent serves up sizzling soul/rock, the stripped-down, one-man band format of which makes for an infectious primitive/modern mix; rhythmically recalling the Fat Possum label’s “blues-and-beats” phase of the early 2000’s. His take on Junior Kimbrough’s “Do The Rump” funks as hard as the title suggests. “Wash Your Hair” hangs somewhere between Prince and Curtis Mayfield. “Power” is a fiercely rockin’ “attitude” track. Good stuff.